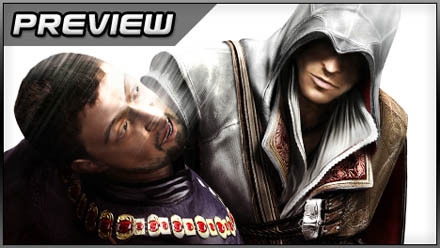 Ubisoft’s much-touted Assassin’s Creed was one of this generation’s greatest disappointments. Is the sequel a killer app or a stab in the dark? 15th century Venice’s rooftops were considerably more populous than those of 12th century Jerusalem, by Ubisoft Montreal’s estimate at least. The bowmen pacing from one cornice to another are old news, perhaps, but there are now gaggles of lowlifes squatting round sodden camp-fires in among the turrets. I interrupt my progress along the skyline to give one particular trio a closer inspection. A mugshot pops up in bottom-left as I near, and a tap of start button opens the relevant entry in Assassin’s Creed 2‘s comprehensive database, adrift on a sea of silvery digital pretence. The lowlifes are thieves – agile, discreet and very receptive to the jingle of ready cash in reasonable quantities. I decide to give this band some work. A tap of Y transfers a handful of coins instantaneously to their pockets (beats internet banking, doesn’t it? ), and the three men fall in dutifully behind. Being denizens of the heights, my accomplices know red-hot free-running when they see it. Awed exclamations dog my heels as I gallop up a chimney pot, bounce over to the apex of the adjoining building and trot over some projecting beams – all without so much as a downward glance. They’re equally impressed when I hang off a gutter, brace my feet against the wall and kick back into a death-defying thirty-feet stoop onto a patrolling guard, but less so when his friend spots me tugging my wrist blade loose and sounds the alarm. Time, then, for my new employees to earn their keep. This they do admirably, pouncing on my pursuers and buying me time enough to disappear into the city’s rainy fastness. Safely cloistered atop a tower, I listen to the sounds of battle diminishing and contemplate my next move. Unless game director Benoit Lambert is telling dirty great fibs, those thieves are just three drops in an ocean of variety. Having failed to give players enough to do first time round, Ubisoft Montreal has carpet-bombed Assassin’s Creed 2 with features. Fond of the wrist blades? Now you can wield two at once. Dab hand at melee? There are maces, axes, falchions and more on offer. Partial to the element of surprise? You can yank people backwards off rooftops by the seat of their trousers, gut them as they peer into haystacks (remember the proverb about the needle? ), even drag the poor sods into the drink. Between the move-list, new weapons (there’s a single-shot gunpowder device, among other toys), the number and size of the cities or the quantity of missions available therein, the developer’s second crack at the franchise is as heavily accoutred as new frontman Ezio’s fetching leather belt. Ezio – murderous, refined and quite well-off – is the several-times-great-grandson of the first game’s Altair, and several-times-great-granddaddy of modern-day fugitive Desmond Miles. Miles once again features as time-travelling puppet-master, reliving his ancestor’s memories via the Anima machine in order to penetrate deeper into Assassin’s Creed’s millennia-old biochemical conspiracy. Posted in Previews, Spotlight, and tagged with action, Assassin's Creed 2, PlayStation 3, preview, PS3, Ubisoft Montreal, Xbox 360. Nice post. I learn something more challenging on completely different blogs everyday. It would always be stimulating to learn content material from other writers and practice a bit one thing from their store. I’d desire to use some with the content on my weblog whether or not you don’t mind. Natually I’ll offer you a hyperlink on your web blog. Thanks for sharing.